The Dotty Hippo Blog: What do you put in a party bag? Our oldest daughter is now in her twenties. Looking back 20 years, party bags were a much simpler affair - just a few sweets and a piece of birthday cake. Over the years, party bags seemed to get bigger and bigger. In 20+ years of receiving and giving party bags the sweets seem to be the most important from a child's point of view. For many children, our own included, parties are an opportunity to have the sort of sweets we don't usually encourage at home - haribo, sticky lollies etc. The cheapest way is to buy large packs from Wilkinsons, Supermarkets, Pound Shops etc. and then split them. It's easier to think of what to put in your party bags if you have a theme for your party. For example, if you have a pirate party you could put in some chocolate coins, for an explorer party some of the long jelly worms would be great etc. You can carry on the theme with other items such as stickers, badges, notebooks, fridge magnets etc. 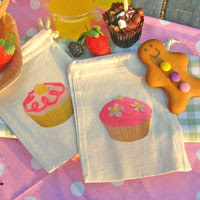 www.partybees.co.uk - A great selection of filled cotton party bags for boys and girls from just over £3 to £7. Although the bags are the traditional pink and blue there are some good choices for girls which don't assume that they all want makeup and hair bobbles. You may want to add some sweets too so factor this into your budget. 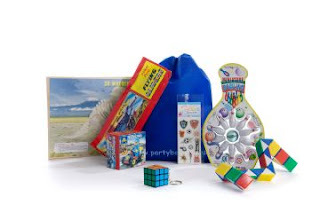 The boys one above includes: Sheet of Boy's Stickers, Lego Sports Car, Flying Glider, Rubik Snake Puzzle, Wooden Dino Model, Mini Key Ring Rubik Cube and a Mini 10 Pin Bowling Set. More expensive, but with some great ideas, is www.littlecherry.co.uk. 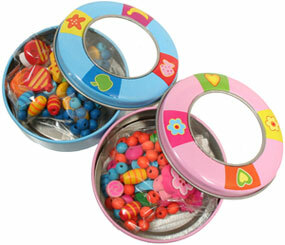 They have cotton and paper party bags and a wide selection of eco-friendly party bag toys. Or of course, you could always start a new trend and not give a party bag!